Thank you for any help with the following question. I have a set of three bowls, approximately 4 1/4" in diameter, with an unknown mark. 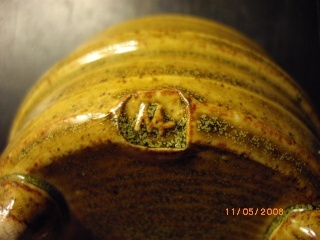 I've attached photos of one of the bowls, and a close-up of the mark. I'm new to your wonderful site and forum, and truly appreciate any help regarding ID-ing the bowls and any additional information about the potter, etc. P.S. I'm trying to upload a photo of the bowl, but am having a bit of a challenge. I'll post the photo of the mark, and will try to add another photo. Sorry for the inconvenience! It looks like the last UK mark that Warren MacKenzie used when he was working at Dartington in 1963. Did he continue with the mark when he went back in the States? Noting where you live, I suspect the answer is yes. You are awesome! Thank you for the information! Thank you for such a wonderful and fast response! Ironically, I purchased the bowls at auction years ago along with four petite Bernard Leach tiles. I've always cherished the items, but now see the similarities in their influence. 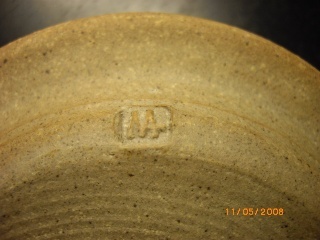 With your help, I found the identical mark online for a bowl by Warren and Alix MacKenzie, circa 1950s. Again, thank you so much! Are these pieces by Warren MacKenzie? Saw a mark similar to this when I was looking at pottery the other day on ebay, but I don't always believe what I read on eBay. That would be great if it was. Now only couple of hundred pieces left to identify! Born 1924, MacKenzie doesn't need much introduction given his apprenticeship with Bernard Leach in the early 1950s. 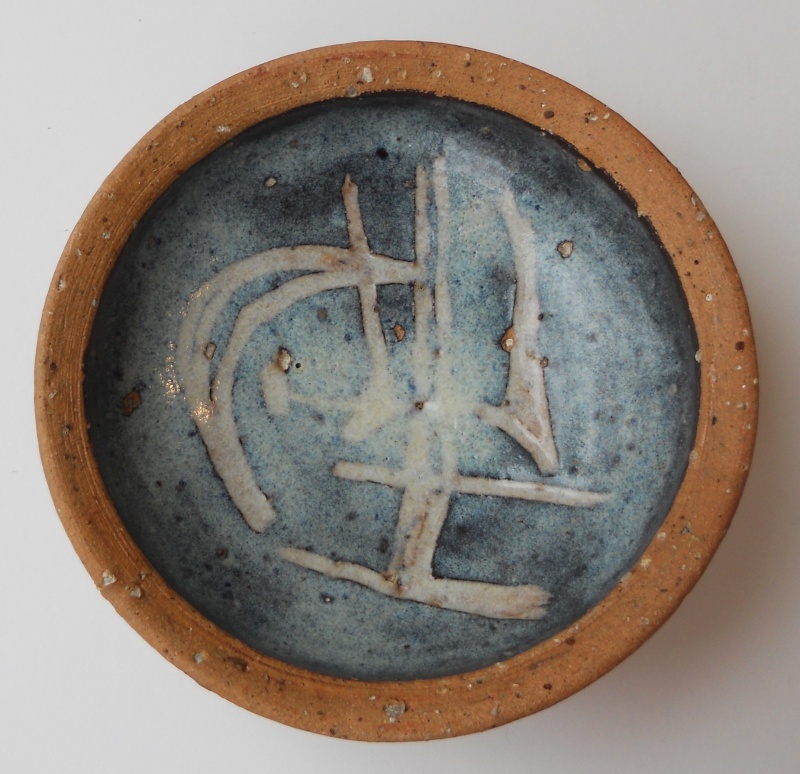 I really only collect UK studio pottery but wanted an example of his work just to see what all the fuss was about! To tell the truth I was a teeny bit disappointed when it arrived, it's a bit lacking in character. 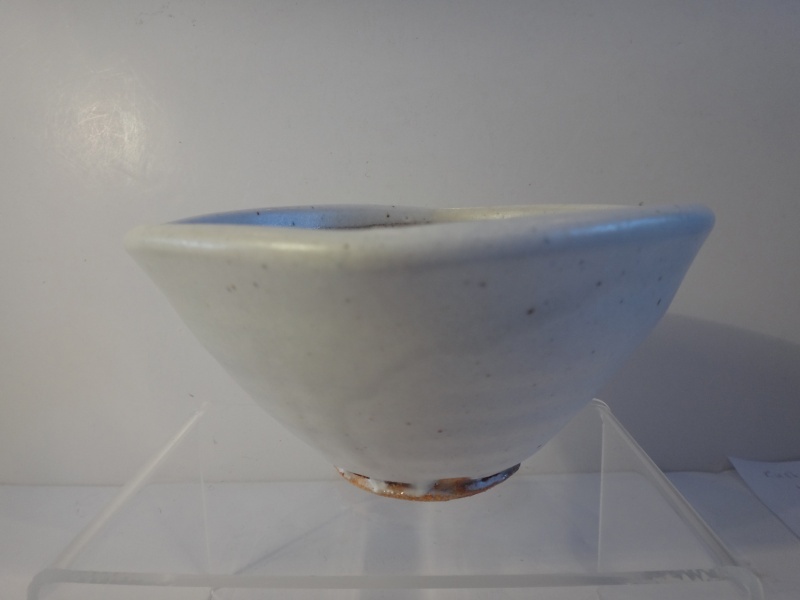 I think this simple white rice bowl was made quite recently given its condition and the fact it is stamped, he didn't use a stamp for long periods apparently. More information on his Wikipedia page Warren Mackenzie wiki page. 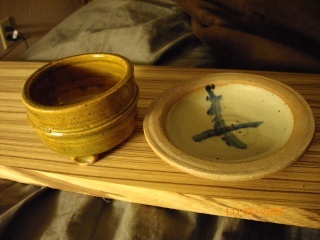 The bowl is wheelthrown and manipulated stoneware. 7cm (height) 14cm (diameter). This small bottle was made by Warren at Dartington in 1963. 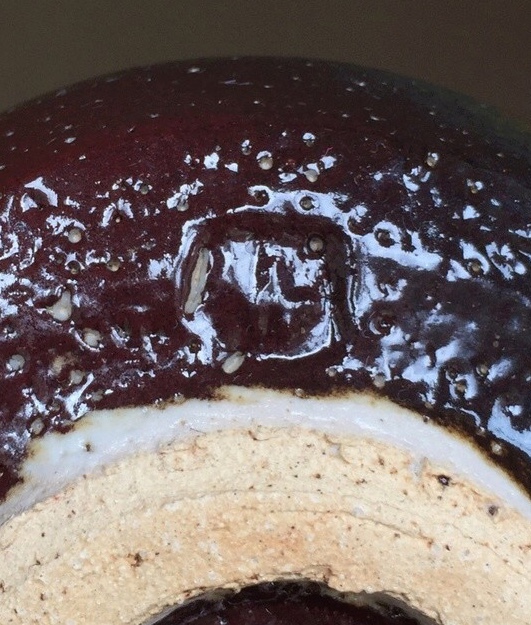 I have tried to show the mark but it is covered in glaze and is slightly clearer in reality. The mark is as shown in BSPM. They do have a thing about him in the States but of the North American potters that worked at the Leach Pottery the Canadian, John Reeve, is my favorite (well this is the N. American thread). 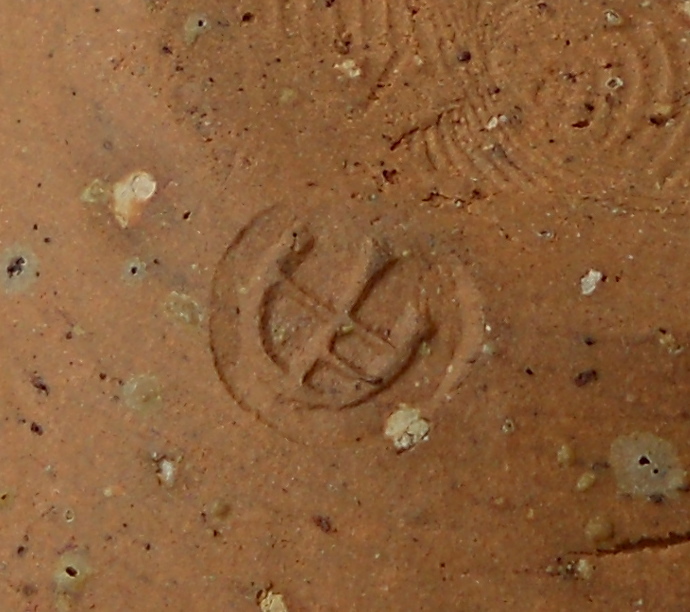 The stamp mark shown for the white bowl is actually a mark used by Warren and Alix MacKenzie (his wife). They have not been together for a long time, and I don't really know if she is still alive; but the mark itself indicates that is an earlier piece. Frankly, I don't know what all the fuss IS about. I think his work is boring. Hate to leave the last post on Mackenzie one so negative! 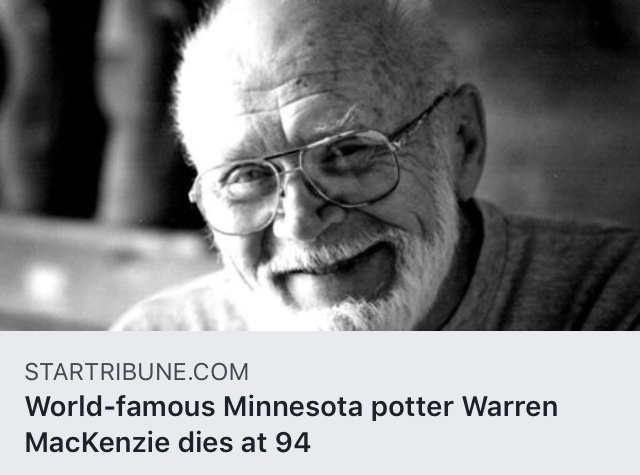 Truth be told, I once thought his work to be dull as well -- when I was a young, cocky and opinionated artist attending the U of M, and Mackenzie could often be found passing through the halls of the old art building with a considerable entourage. It wasn’t until years later, when I came across a piece of his in the wild and brought it home that I was able (ready?) to appreciate the quiet masterful beauty of his work. Many more pieces down the road, and I am only more and more impressed. Over the years I have owned many pots by many potters, and Mackenzie's are consistently some of my favorites. 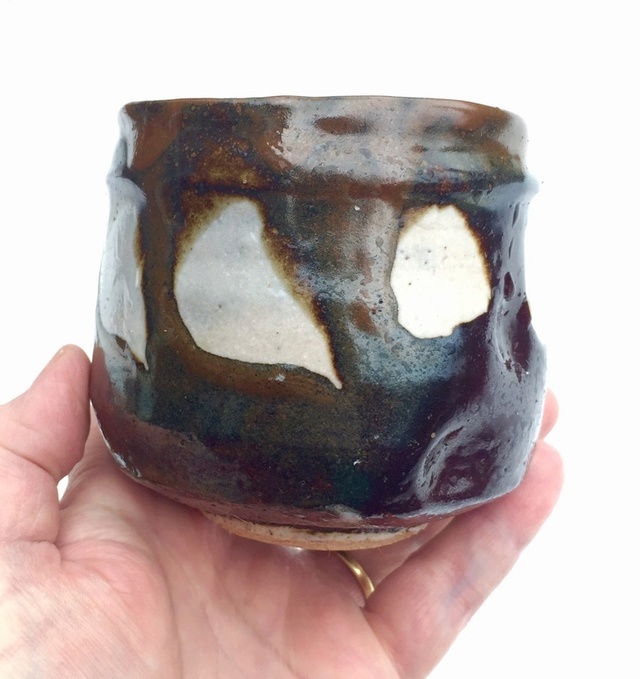 Yes, some are better than others, and as a production potter he often repeats shapes and glazes, but I find even the smallest and fastest pieces to be extremely well executed, humble and tasteful, and I have yet to find myself bored by his refined shapes or palette of glazes. Perhaps you may consider the possibility that the more one is acquainted with a potter's work, the more one many be able to appreciate it -- that may explain the "thing" we have "about him in the States" as his work is more prevalent here. After-all, we all know that seeing a piece online is nothing like using and handling a piece in person. A last thought to consider: how do you explain the large number of talented and successful potters whom have worked under him and whom still accredit their tutelage to him if the breadth of his work is so easily summed up as merely "boring"? A mass of misguided (MN) mingei lovers? As for the mark above, it does appear to be the early mark that was used with his first wife Alix, whom passed in 1962. She did much of the glazing up until then and some of her earliest engraved and painted abstract design work is truly a joy!